Races and aliens were the topic of this month’s RPG Blog Carnival. RPG bloggers worldwide wrote about this interesting and possibly controversial topic. We had new races and species, some GM advice, and some musings on racism in fiction and in life. Here's a round-up of their posts to make it easy for you to find all the articles. You can also visit the Blog Carnival Archives to catch-up on previous months’ topics. RPG Alchemy did a three part series on Breathing Life Into Goblin Civilization => Part 1, Part 2, Part 3. John and Samuel also did a nice piece on making races distinct in Beyond Humans In Masks. James over at the World Building Blog gave us a cool new race for dragons => blizzard dragons! Mike Bourke over at Campaign Mastery gave us two in-depth pieces => Alien In Innovation: Creating Original Non-human Species and Studs, Buttons, and Static Cling: Creating consistent non-human tech. Scott Rhymer at The Black Campbell offered us some thoughtful social commentary about racism in genres and games. The Gaming blog of General Tangent tackled the tricky topic of racial hatred in settings. Leicester's Ramble wrote up a new race of centaur-like half-dogs called the Canivirum. Over at ruimte kameelperd, Jerall gave us an interesting look at Human Ethnicities in the Cape Town Metagame. Phil at Tales of a GM rolled us up a cool GM design diary for creating the nautilus species. Next, the carnival sauntered over to Fantasy Roleplaying Planes for two articles => A look at character attributes and race, and ?The Cure to an empty room?. Then Sea of Stars offered a new race => Human Variant – Kanamit (for Pathfinder and D&D5). And to round up the round-up, Nils at Contact Light gave us a trio of blog posts => Humans As A Baseline, Well, What Sort Of Aliens, and the shapeshifting Dessa. Thanks to all the bloggers who joined the RPG Blog Carnival this month. You offered up some tasty goodness for gamers about races and aliens. Be sure to visit the archives to catch up on past topics and to check out the topic happening right now. Hola fellow GM! I write books and tips for tabletop game masters who want to level-up their game. I've been doing this for 15 years now for free to help GMs out. 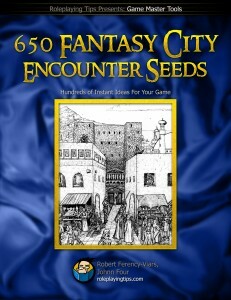 And I'd love to make a Diplomacy check with you and offer my book, 650 Fantasy City Encounter Hooks, as a THANK YOU for giving me a chance to help you have more fun at every game my with my GMing tips, tricks, and campaign stories. I'll email you regularly with advice, contests, specials, and new GM techniques. You can unsubscribe with one click anytime!